In the pantheon of legendary technical analysts, perhaps none sit higher than Richard Wyckoff. Observing the market in the early 20th century, Wyckoff pioneered a method of technical analysis that is still widely used by traders today. The Wyckoff method is one of the best blueprints when it comes to picking winning stocks, the best times to buy them, and the most effective risk management approach. 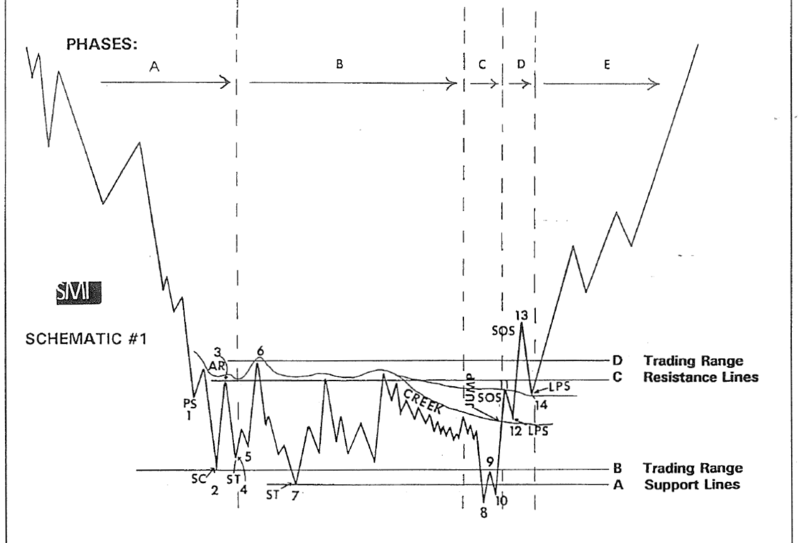 Observing price action, Wyckoff ultimately formulated his theory which identifies key elements in the development of trends. In his model, these periods are marked by accumulation and distribution. Determine where the market currently sits and project its future trend. Pick assets that go along with the identified trend. Pick assets with a “cause” that equals or exceeds your minimum objective. Determine the assets readiness to move. Time your move with a turn in the forex market index. The key part of Wyckoff’s market observations was with price movements. In order to understand assets and the market as a whole, he developed a practical method he named the “composite man”. Wyckoff’s “composite man” posits the theory that all the price movements in the market should be looked at as the result of one man’s manipulation of assets. If you don’t understand the game as he plays it, the assets move away from your favor. If you understand it his way, it will work in your favor. His big advice to traders was to play the game as this fictional composite man played it. His belief was it didn’t matter if the market moved because of real buying and selling or whether it moved via artificial, price manipulating moves by larger operators. Within his method, Wyckoff laid out several rules for traders to follow and look out for. Context is king in the financial market. This means that the only way to deconstruct today’s price is to look at it historically. What did it do yesterday, last month, last year? This infers that analyzing today’s price out of context will lead to incorrect conclusions. The main reason for forex traders to use Wyckoff’s method is because it allows traders to recognize upcoming price moves. By marking the end of an accumulation stage, traders will be alerted to the beginning of a markup. They can then proceed to trade on the long side. On the contrary, the end of a distribution phase marks the beginning of a markdown in which traders can trade on the short side. When you understand the different stages within the price cycle, it allows you to position yourself for the next expected price tendency. You can try to buy as near to the beginning of a markup and hold as near to its end as possible. While there is a clear concept put forth in the Wyckoff method, the details are far murkier when it comes to clearly defining figures and patterns. This could be a major setback for new traders not yet familiar with the ins and outs of the market and price movements. It takes a lot of experience to master the method. Another drawback of the method is that it’s not ideal for high-frequency trading. It works best on short timeframes, so if that’s not your angle, consider another method or theory. Once you perform your Wyckoff analysis, the current market cycle should be clear to you. But in order to take full advantage, your trading plan must account for it and be readily executable. A well crafted trading plan that seamlessly incorporates the Wyckoff method could be productive for the right trader. But traders with less experience need to be advised that it’s a highly complicated process and takes much time to master.